Learning how to approach a task can be far more interesting and valuable than learning how to ‘do’ a task. 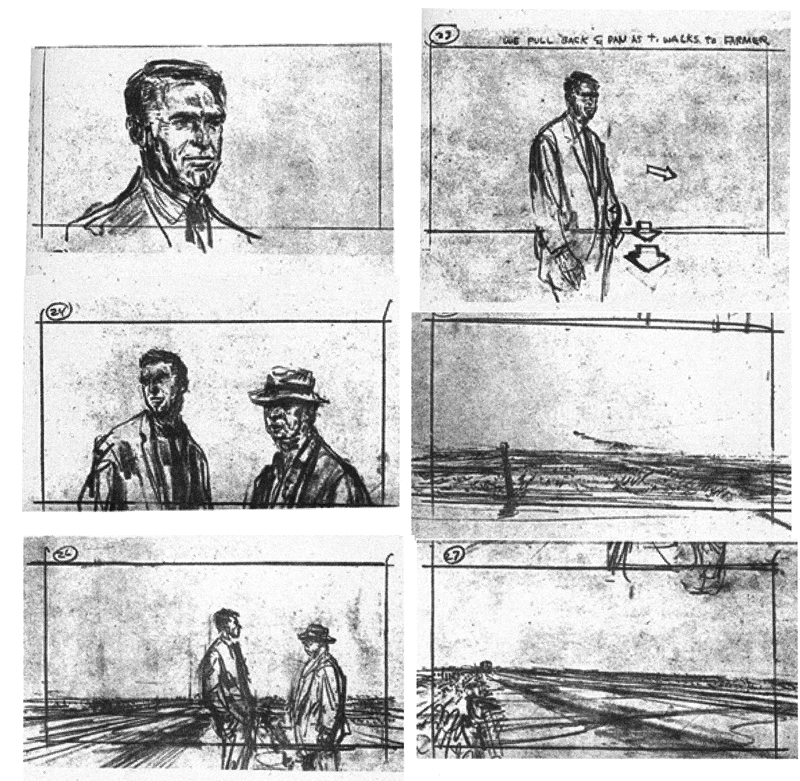 In 99% of the cases, to translate a movie script into visual content is one of the duties of the film director. How would you approach the visual breakdown of the script? How would you transform the written words into visual information that can be shared with the production designer, the director of cinematography and the rest of the cast and crew? Being a director consists of a lot more than simply covering the action and storyline with a ‘bunch’ of shots. We have to analyse the story and character development and support it, enhance it and/or reshape it aspiring to deliver something that feels ‘stylistically whole’. In Film Directing and Cinematic Motion Steven D Katz defines this as the task to “find the essence of each scene from a photographic perspective,[…] respecting the intention of the script without being limited by them” He proposes to get there in stages, or passes. These passes also offer a good occasion to edit the scene and to fine tune your dialogue, and sometimes are best explored as part of the rehearsals. In the chapter Visual Script breakdown (available here) he describes the various questions and processes applied during these various passes, outlined here below. Free association pass: This is ideally performed during the first read. You can simply dump ideas onto the page. Add or remove details. Do not try to be all encompassing. Simply let these annotations reflect those initial powerful ideas that instantly came to mind when reading the written words; the most powerful images. Do not concentrate only on visual ‘content’ and perspective, but also on what the atmosphere is like; the colors, the lighting, the sound. Remove stage directions that describe the characters inner life, “longingly,” “kindly,” etc. These judgements encourage restrictive result direction. Remove directions that depict blocking or business with no plot consequences in order to allow the actor’s movement to be generated as a natural part of their performance. Pay special attention to character’s personal objects while ignoring any adjectives or adverbs. Avoid making judgements, instead, explore all possibilities. Look for backstory facts in the dialogue, they are part of the reliable skeleton of the script. Highlight directions that describe an emotional event but remove any descriptive words translate any psychoanalysing explanations (“He cannot look away”) into emotional events (“He does not look away”). After removing unnecessary description you’ll be left with very sparse, circled or highlighted stage directions which will contain clues to the physical and emotional life of the characters. Moving back to our Visual Breakdown. First Pass Breakdown: Map the emotional outline of the scene. Motivations and ways of fulfilling them. “The most salient dramatic points of the scene that might lead to visual ideas” What is the scene really about? How does it change the status quo existing at the beginning of it? What are the important beats that constitute it? History – Character biographies can be created by the actor or writer. These are facts that are not in the script so they should only be used if they stimulate the imaginations of the actors and catapult them into their sense of belief in the moment. What Just Happened – By filling in the moment-by-moment life of the characters before the scene started we create a sense that the scene is “in the middle of” something. Objective/Intention/Need – Keep to one objective per scene per character unless a character has different objectives for different other characters. Issues/What’s at Stake/The Problem/The Obstacle – A character’s through-line or primary engagement is not always with the other person in the scene. The primary engagement may be with an image or memory, another person who is not present, or even an object. Action Verbs – The action verb is what a character is doing to get what she wants. Translate result based direction into an action verb. Adjustments – By adding and adjustment to an actors choice an undercurrent can be added to add depth to the performance. Physical Life – Pay attention to the physical objects and activities of the characters’ world. Objects interacting with the characters’ can become characters in the scene. Second Breakdown: This is where you imagine action. How can we use positioning/staging and motion to strengthen (or at least play) the emotional map discovered in the previous step. During this pass we block the positioning and movements within the scene. We could already map these actions on an overhead diagram. Some directors like to observe the actors’ instinct during rehearsal. The better informed and the more dedicated the actor the higher the return will be on the freedom we have awarded them. Third Scene Breakdown. Here we start to question the point of view. Map them for the key steps or moment in the script. Where are you placing the audience? Is it going to be wide, medium or tight? Are we going to bring the audience inside the action or let them observe from a more voyeuristic angle? Will we favor a character over another? Will we move the audience or will we let them stay still? At this stage we can truly make it ‘visual’. In other words, we can storyboard. I am not advertising this as the way of approaching a visual breakdown. Eventually, these various steps can be performed in a combined fashion or even be operating at a subconscious level. These are important questions that need to inform your direction. The rediscovery of the script and its translation will inform further discussion the director will have with the other key creatives. Remember Steven Spielberg’s words: “When I was a kid, there was no collaboration; it’s you with a camera bossing your friends around. But as an adult, filmmaking is all about appreciating the talents of the people you surround yourself with and knowing you could never have made any of these films by yourself.” Those talents need to be guided by an informed and thoughtful vision. It’s about a lot more than just coverage. Directing, Preproduction- A great piece explaining how to go about visually breaking down a script.